Sometimes there is a loaf that I just love baking. This is such a loaf and I think it is due to the fact that it is a simple dough that has a luxurious feel to it - especially after it has fermented all night in the refrigerator. It also has a wonderful aroma created by the lemon zest and the poppy seeds add a delightful texture and, I think, simply look spunky. The original recipe if from Daniel Leader's book Bread Alone. I found it after reading about one of the challenges posted here where the '3grandmas' were baking his lemon cake. All raved about its results. I prefer baking breads to cakes so this is what I ended up with. I adapted his recipe to my sourdough starter, my use of whole grains and use of an overnight bulk ferment. • Build leaven during the day. I do 2 builds total each about 3 hours apart. • Mix leaven, water and 3/4ths of the flour into a shaggy mass and let it sit for about an hour to allow the flour to hydrate and the gluten to develop a bit. • Add remainder of the flour, honey, salt and the zest and knead on low until medium gluten devel. is reached. • Knead until seeds are distributed evenly. • Place in refrig. for the night. • Allow dough to warm up for about 2 hours the next morning. The roll is lighter in color simply because the rolls were baked with the boules but, obviously, they baked much more quickly. 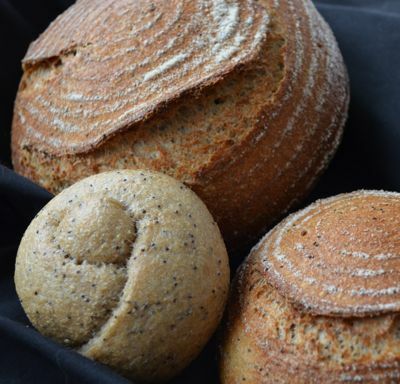 They have a softer texture which my husband prefers while the boules have a crustier crust. Our house now smells heavenly. Sorry, no crumb shots. Boules are for friends that I bake for. Husband gets a couple of rolls. They don't present much of a crumb shot......I can tell you the crumb is soft though. Lemon conditions the grains and makes for a very soft crumb. I will give you all a snow shot instead since we got 12" of much needed snow today. Wow...what a nice adaptation. Funny thing is I have my own lemon sourdough waiting to bake later tonight. 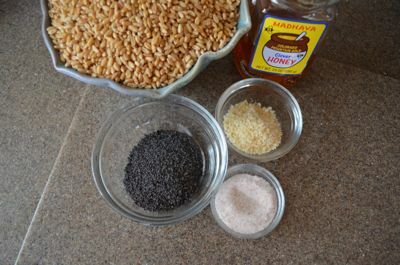 I like your idea of using the honey and poppy seeds and will have to try your formula soon. Not sure how mine will come out as I used lemon zest and the lemon juice in place of part of the water. How did your crumb come out? Nice to see you posting one of your bakes. I used lemon zest too. KA's - not fresh. The only time I have used lemon juice in a loaf it was goo by morning. The only thing I could think of that would have done that was the juice -and I didn't add all that much so I am curious to see how your loaf turns out. Well it looks nice but won't know until tomorrow when I cut into it. I'm a bit nervous what the crumb will look like. Looks like I struck out on my latest bake. The lemon is too overpowering and the crumb is to dense and gummy. I should have cut back on the lemon juice and the hydration. I think too much lemon juice in the starter slowed it down too much and the dough did not develop correctly. I will have to try your once I get the taste of lemon out of my head! Sorry to hear about your bread. I know mine with juice didn't turn out either but the people I gave it to still loved it! They aren't as picky as I am about results :-) Always learning something new. I find it interesting that zest is fine in a loaf but the juice is just too much....I am sure there is a chemical reason for that but I have no clue what it is. Acid for sure and I guess it is more concentrated in the juice than the zest. Onward to the next loaf! I don't know if this is true, but I know citrus juices contain different types of proteases (at least according to this very old handbook, pages 6 and 7), which may or may not break down gluten or thereof. Perhaps that's why your crumb was dense and gummy. Where on earth did you find that gem? It's older than me and I'm getting old! Thanks for the insight. Either way, if I try this again I will use much less lemon juice or probably just the zest like Janet. Zita, Wow, what a find! Wow, what a find! Explains why the rind doesn't break down the dough and does give it a luxurious texture - rind contains the oils without the proteases. Thanks for sharing this! to the Honey Lemon Whole Wheat bread from Clayton's The Complete Book of Breads. His is yeasted and has no poppy seeds but the whole wheat / honey / lemon peel marriage is still there. And it's good! As I'm sure yours is, too. Lovely bread, Janet. Yes, this is very similar to his though his has shortening added and mine - sans fat. I think the added fat would make his crumb even softer than this one. I love his recipes though I have always changed them so I can use my sd as a leavening agent instead of IY. He really was a bread lover with a wide range of breads at his command. I have gotten a lot of my holiday loaf ideas from him and love the loaves he has included that were baked by nuns in various monasteries around the country. He was in a class by himself for many years. I love the combination of lemon and poppy seeds and with honey and whole wheat how could it not be a great bread. The little roll is very nice as well - I'm sure. You got a nice rise on the boules and they look perfect! Crumb shot? Great bake. Aromatic it truly is. Kinda like aroma therapy on this snowy day :-) Thanks for your complement. This is a such a fine sounding bread. I was going to give the 3 GMA's Lemon Tea Cake a shot tomorrow but, since I also have Wingnuts 'old dough' vs levain experiment going for Tuesday, I think will convert it over to poppy seeds; black white and brown and lemon zest w/ juice (just a tad so no goo sets in) tomorrow instead. We love lemon anything around here. I'm going to check up on Clayton's recipe that Paul talked about too. I have always loved to bake breads and variations from his 'Complete' book that was fairly complete at one time in the early 70's. I have read in one of your previous posts about shutting off the oven when the bread goes in to steam. I haven't tried that yet but will for this bake. Nothing like killing Wingnut and Janet birds with one bake! 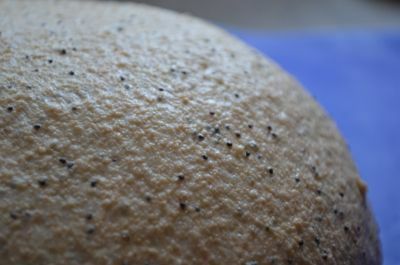 I like the gringe and the speckles the poppy seeds leave on your bread. My daughter is the only one who likes lemon or orange tones in breads.....Husband and son don't like it at all despite my trying to entice them into liking it.....so far I have failed completely in that department! Thank you for your kind words about the loaves I baked today. I look forward to reading about how your lemony loaves turn out. that if we put lemon in the bread for tomorrow's bake we would completely mess up our Wingnut experiment of testing 'old dough' against fresh levain for the amount of sour it produces. But no worries, we will be dong a lemon and poppy seed bread bread very soon. It sounds great. Those are beautiful loaves & rolls. I'll have to give lemon zest a try. Right now I have this 8oz bottle of orange oil that I have to work off! As far as your hubby and son, you could break them into citrus hints with brioche or another enriched dough. Sourdough pancakes with a hint of orange ore lemon zest are good. Thank you for the complement. I have one of those bottles of orange oil too. Isn't going anywhere fast though so is stored in the refrig. I LOVE lemon zest ... these breads must be delicious! Wow - never ending rain. I know that can be a drag BUT we have had NO moisture here for ages. Like a year!!!!! We totally depend on all of our water for everything from rain and snow fall so this is a very welcome event. Our reservoirs need filling. Also, it is the end of Feb. so we know winter is on its way out. Today is beautiful and sunny so the snow looks brilliant. Sun glasses a must. Oh dear, Janet, how beautiful those boules look! The color of the crust, the bloom, and the markings.. i love it. The rolls look soft too. On top of all, they are healthy, what's not to like? Such kind words warm my heart :-) Thank you so much. I figured I better post a 100% ww loaf since there are so few here who do. I always look forward to the ones you post and I love that you use Laurel's recipes too. Just amazes me how a small scale ww baker in a dinky town in California can reach someone as far away as you with her loaves. Most people here haven't even hear of her! I know this may sound odd, but your photo induced the Canadian in me to miss snow... I haven't seen a snow flake for over 4 years! I grew up in San Francisco. I can get nostalgic for fog and it has been over 30 years since I moved away from there so I understand what you are saying. Where in Canada did you live before moving? Thank you for the complement on the loaves. Learned most of what I know from people here like you who share what they do in their own kitchens :-) Amazing this Internet!!! Haha, yes, the Internet is truly amazing. Where would we be without it? Prior to moving, I lived the majority of my life in Ontaria, Canada, in a city near Toronto. My home was adjacent to the woods and during the snowy winter, the trees would strip themselves bare, reaching the skies with their barky limbs. Probably one of the most beautiful sceneries I had the pleasure of witnessing is a red cardinal, perched atop a pine tree, chirping defiantly during a snow blizzard. The contrast of red against the white background was stunning. Sounds beautiful. I do love a good snow storm. Ontario is cold country. I imagine very different than the climate you are in now. Kinda like 2 extremes! I had a hawk in my front yard yesterday. He/she was large and noble looking but I know he/she was looking for an easy meal and knew my bird feeders were the bait needed to attract his/her prey.....I don't think he/she had any luck though. What a nice post Janet. Great photos! From your comments and other posts, I know you are a great baker, but you (like mini) rarely post your own bakes. Wow, if this isn't a nice one and I'll bet your house smells good, from real lemon and not some artifical stuff in a cleaner (sorry -- got Lemon Pine Sol on the brain and in the nostrils -- we use it to mop our kennel and if that's lemon, well...never mind). 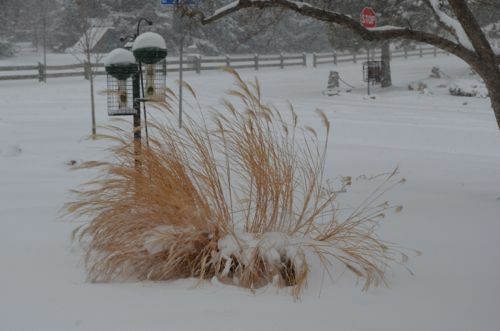 Your place looks like ours, but ours has mercifully less snow. Until tomorrow, they say. Now we've got this weird ice-encrusted leftover snow that our dogs refuse to run on -- probably as much because of our laughing at their slipping and sliding as their own paw discomfort cracking through it. Our dogs love the snow. Both are older now and my 11 year old slips on the ice due to weak back hips so she was delighted to be able to pounce around in this stuff without worry of slipping.....not sure dogs worry but she acted less timid then when I take her for walks on slick roads. I hate household cleaners with artificial scents too. Can't understand the idea behind that one. We just got ss appliances and every ss cleaner I have looked at smells awful. My favorite mode of cleaning is with vinegar and baking soda. Use it on almost everything but it doesn't quite cut it with the ss.....My search led to the Interned and I ordered a couple of products that are supposed to be scent free.....will see how they work. Spent most of yesterday shoveling that liquid sunshine. Good day to bake! How do you do the shaping on that roll. It is very cute! Looks amazing and I'd love to bake this. I'm a bit of a nvoice though so need some help, what does "building a leaven" look like? I assume you start by mixing starter with flour and water, but how much and why do you build in stages? Thanks! It simply means that you take a smaller amount of your starter and feed it fresh flour and water a couple of times to build it up the final amount of leaven you need for your dough. I keep my builds 3-4 hours apart to keep them from becoming too sour. (I use freshly ground grains which ferment more quickly and therefore can become more sour if left for longer time frames.) You can easily just do one feed 6- 8 hours before you need the final leaven you will use in your dough. Many here feed their starter in the evening and in the morning they are ready to use it. Ingredients all combined at about 6:00 PM. Total Leaven = 235g. Th excess was saved to be used in the next day's build schedule. You might search for more information using the search box. I know people post photos showing their leavens in various stages of 'readiness'. The visuals can be very helpful when learning how to tell when a leaven is ready to be fed or used. I have listed times but those are based on how my leavens behave. Yours may ripen in a shorter time frame or a longer one. As with most things bread - it is important to watch the dough and not the clock. Wow Janet that was speedy thank you! Will give these a go over the next week or so and let you know how it goes. Thanks again. Janet, how did you shape the light colored roll. Janet, how did you shape the light colored roll. I don’t ever remember seeing that shape before. Is there a name for that shape? I’d like to learn. Janet, I don't usually proclaim homebaked loaves as art, but when I view your Honey WW with Poppy Seeds & Lemon Zest I happily make an exception. Right now I'm hours away from my Starter being ready after feeding so I've been ruminating on recipes. Yours is probably going to be the choice. Instead of WW I plan to use Red Fife. However, one question: how do you do the preferment? OK, that's all for now, again...Thanks.